Myanmar Train Ticket | Myanmar railway Ticket | You can visit to Kyaik Hti Yo (Golden Rock Pagoda) by train happily. 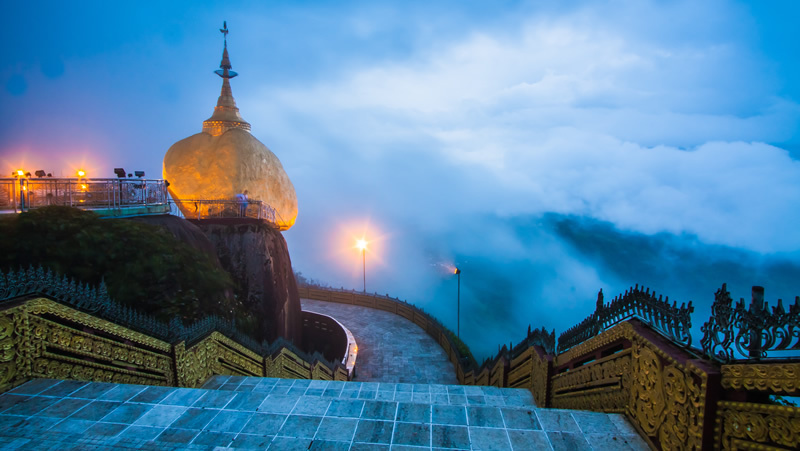 How do you visit in Kyaik Hti Yo (Golden Rock Pagoda) ??? What will you do when you arrive there ??? We would like to inform that you can visit to KyaikHtiYo Pagoda (Golden Rock) by train or Express bus which will drive about 4 hrs roughly. If you visit Yangon to Kyaikhtiyo by train and return back to Yangon by bus which can get best experience in your memories. Depart at 7:15 am from Yangon to Golden Rock with Upper class and you need to arrive at 30 mins before your departure time. You will arrive Kyaik Hto Railway station around 11 am. You need to take the bus (such as Light truck) and it will take 30 mins to go KinPun Sakan (Golden Rock Mountain base) from Railway station. You can visit little stream at the base of Mountain before you go to Golden rock Pagoda. After visiting Golden Rock, you can return back to Yangon by Express bus or you can stay 1 night in Hotel at the top of Mountain.